Fill your home with the true-to-life fragrance of freshly zested grapefruit—a wonderful, bright aroma that will lift your mood and breathe energy into your day. This sparkling scent provides an instant pick-me-up, banishing sleepiness and 'brain fog', alleviating mental fatigue, and helping to combat sluggishness. If you struggle to get started in the morning or find yourself simply exhausted by tea-time, the motivating aroma of this addictive citrusy scent is just what you need. Vibrant, exciting, and dynamic, our zingy grapefruit blend will wake you up and supercharge your day like nothing else. Use it in every room of your home or gift it to someone you know who is desperately in need of a natural energiser. The gorgeous scent of fruity grapefruit has been captured by our skilled Perfumer using the finest ingredients. Many of the so-called ‘air fresheners’ available on the market today contain an array of hazardous substances linked to serious health issues, such as lung damage, tumours, hormone problems, and asthma. Our Grapefruit Perfume Diffuser uses completely natural, safe ingredients that protect your health and cause no harm to the environment. The captivating scent of this spirited blend evaporates slowly, beautifully perfuming every corner of your home with a long-lasting, memorable fragrance. 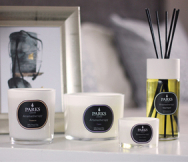 Presented in one of our attractive natural reed diffusers and packaged in our stylish iconic gift cartons with the instantly-recognisable Parks branding, this audacious blend makes an exceptional gift that even the most discerning of recipients will appreciate.